Attendees from the signing ceremony for cooperation MOU between UNIST and KODIT are posing for a group photo at UNIST. Creating partnership to support the growth of local SMEs in Ulsan. Helping local SMEs to expand their businesses globally. 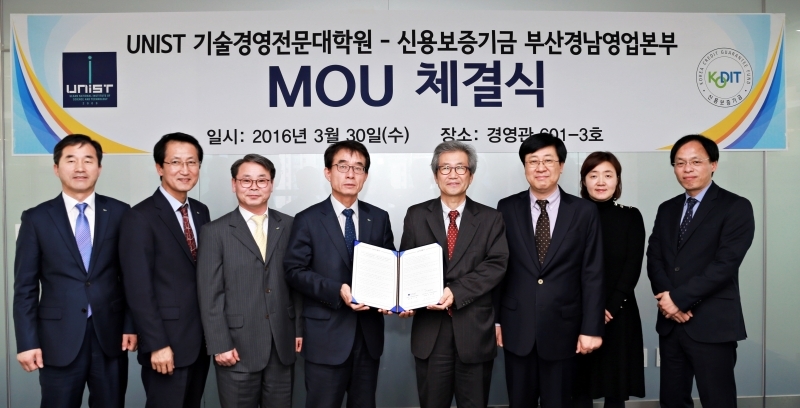 On the afternoon of March 30, UNIST and Korea Credit Guarantee Fund (KODIT) signed a Memorandum of Understanding (MoU), creating partnership to support the growth of local small and medium-sized enterprises (SMEs) in Ulsan. The ceremony was held in the main conference room of the UNIST Main Administration building. In the memorandum of understanding, the two institutes agreed to expand cooperation in various areas, providing financial assistance to local SMEs. Through this MoU, UNIST Graduate School of Technology & Innovation Management will seek out outstanding local businesses, commercialize their technologies, and recommend these businesses to KODIT. In turn, KODIT will provide credit guarantees preferentially to local start-up and young businesses, which are recommended by UNIST and treat them in terms and conditions of guarantee.